Today we have a guest post from Javeria of NurturingEmaan. She is a homeschooler and a mom of three, and she has amazing creative hands-on activities that help little ones learn. She recently posted a coloring book about some of the 99 names of Allah (SWT), and today she is sharing activities to help kids learn about two of the names of Allah (SWT). Enjoy! My 5 year old daughter loves story time and I try to incorporate Islamic stories in as many of her lessons as I can! There is no doubt that storytelling is a brilliant way of teaching children because not only are stories enjoyable for children, they will also remember and learn the concept more effectively. To accompany the 99 Names of Allah ﷻ on my blog, I have made easy and fun hands-on activities that take this learning and remembering to the next level. For this blog, I chose two names of Allah ﷻ Al-Muhyi and Al-Hafeez from the downloadable package. Once you have finished the colouring and story part of the package and the child has a fair understanding of the name and its meaning, get ready for the hands-on activity. For this name, there is no better way to understand it other than making a doll. Thread the large bead onto the 12 in. pipe cleaner and fold it in half when the bead reaches the center. Hold both ends of the folded pipe cleaner together and thread a small bead onto it, taking it all the way up under the large bead (this will be the neck). Now take the 6 in. pipe cleaner, fold it in half and twist it around under the neck bead, then spread out the two ends to make arms. Thread 4 beads onto each arm, two for the upper arm and two for the lower arm. 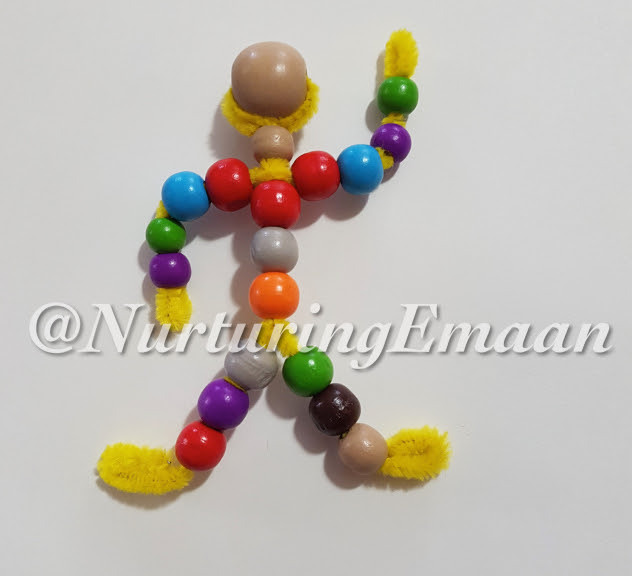 For the body, thread 3 beads onto the folded pipe cleaner under the neck bead, then twist and pull both ends of the folded pipe cleaner apart to make the legs. Thread 3 beads on each leg. To make the hands and feet, fold the pipe cleaners back on themselves (to make little loops). When the doll is complete, ask your child if this doll is alive, can it walk/talk and can it do all the things you can do? No, it cannot do any of these things because it is not alive and you can do all this because Allah ﷻ gave you life, He is Al-Muhyi, the Giver of Life. It is only Allah ﷻ that can give life to something, only He has the power to make things come alive, grow, die and come back to life. You can take this discussion further by talking about different plants and animals too. 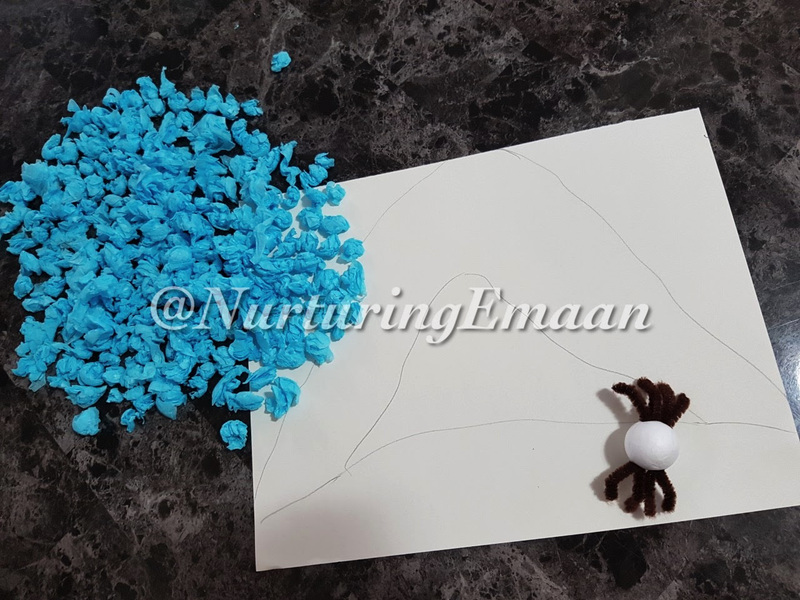 Once you have finished the colouring and story part of the package and the child has a fair understanding of the name and its meaning, get ready for the hands on activity.This hands-on activity is a very crafty one and your child will really enjoy it (mine sure did). Using a pencil, draw a cave shape on the white construction paper. Cut the tissue paper into small squares, and scrunch then into small balls. 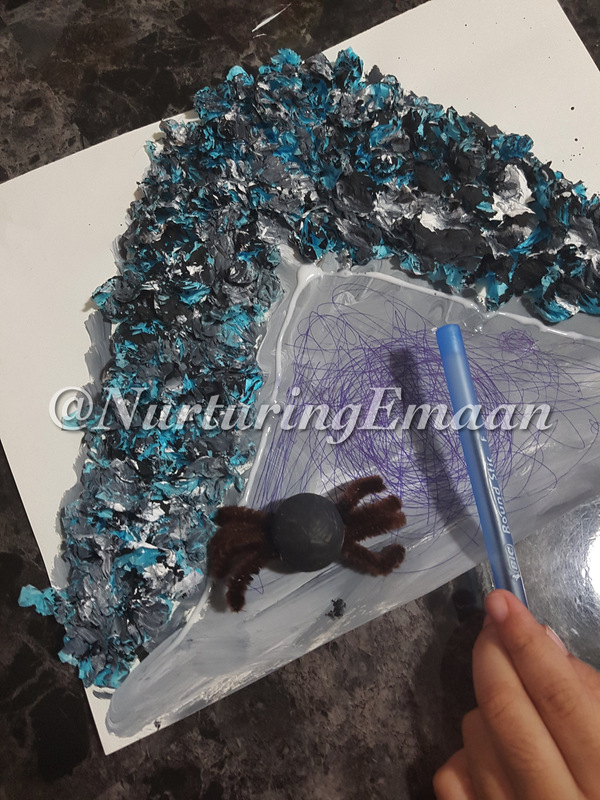 Put glue on the cave you drew and stick on the tissue paper balls. Once the whole cave is covered with the balls, paint it black. 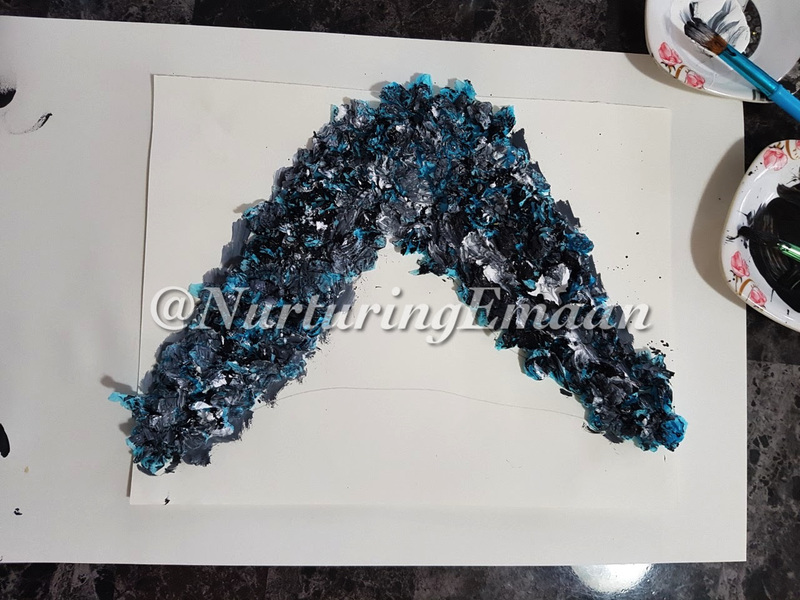 Then using a scrunched sheet of paper, dab it into the white paint and then on to the cave on top of the black paint and leave it to dry. To make the spider cut the pipe cleaner into 4 pieces (2 in. each) and fold them in half. Then poke two folded pipe cleaners on each side of the styrofoam to make the legs. Using a pencil, draw a web at the entrance of the cave and place the spider on it. This activity is directly related to the story in the package (you can download it here). After you have read the story to your child and completed the above activity, have your child retell the story while you emphasize that Allah ﷻ is Al-Hafeez, the Protector. When Allah ﷻ protected the Prophet ﷺ and Abu Bakr from the enemy people who where trying to kill them, He sent the spider to make a web at the entrance to make it look like no one had entered the cave. Discuss with your child that if we ask Allah ﷻ to protects us from something then nothing can harm us in any way, Allah ﷻ is the best protector. P.S. If you loved this post– Javeria will be sharing more hands-on activities about the names of Allah (SWT) very soon, so be sure to follow her! You can find her on Instagram HERE or on Facebook HERE.